This Neolithic monument dates to between 4,000 to 3,000 B.C and is one of the finest examples in Ireland. 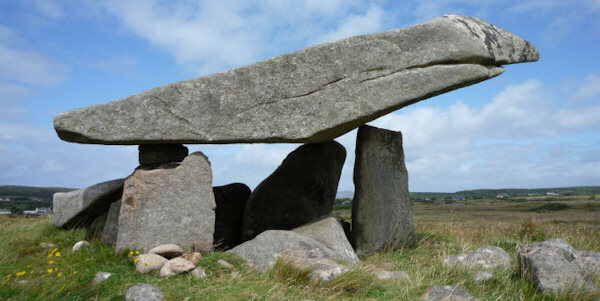 This type of tomb is found in places as diverse as Germany (Hünengrab), Portugal (Anta), Spain, The Channel Islands, Wales (Cromlech) and Ireland (Dolmen). Located in Kilclooney, the monument comprises a huge capstone approximately four by six meters, supported by two 1.8 meter uprights, known as portals and a back stone on which the capstone rests. A notable feature of the back stone is the chocking stone. This may have been used to adjust the angle of the capstone as it was being manipulated into place. The site is unusual in that it houses a smaller (now collapsed) Dolmen, within about 5 meters of the larger structure. In other sites these tombs are covered by stones or soil (cairns), and if this were the case in Kilclooney, then the site given it’s prominent location would have been quite a spectacular scene on the horizon. Access is possible by taking the laneway to the left of the church and following this for the 400 meters or so until you reach the Dolmen (remembering to close all gates before and after you). Please remember that this is Private Lands and treat it respectfully.